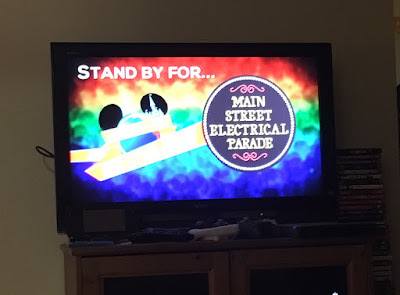 Did anyone watch Disney's live stream of the Main Street Electrical Parade on Sunday night? I did, and was both distressed and baffled by their decision to cut away halfway through the parade and start talking to random park visitors about, like, their favorite to snack to eat while watching the parade or whatever. I thought for sure they'd cut back to the parade where they left off but NO; they SKIPPED a whole chunk of it. WTF? I missed the donkey boys! :( A truly ludicrous occurrence and I'm still kinda sad about it. My prep run for the National Capital 20 Miler next month; my goal was 16 miles but in the back of my mind I knew I wanted 17. Annnnnd I did it! Click here to find out how I managed to make it happen without dying of dread and/or boredom. My hip was just a touch sore after Monday's long run, but nothing I couldn't handle. I may grab some KT Tape and slap it on for my upcoming races as a precautionary measure. Either that, or I went back in time and did Tuesday's walk again. Hard to be sure. So that's my thing. How have your guys been doing? Anyway, now for the roundup. - Flowers Croon refuses to be bored on a run. - Magic of Running is an environmentally conscious pavement-pounder. - Half Crazy Mama makes an awesome Buzz Lightyear running costumes. - Living A Disney Life warns against Disney trip snafus. - Disney Tourist Blog nails why Guardians of the Galaxy in Epcot would be a Very Bad Thing. - Main Street Gazette terrifies me with details of The Great Movie Ride's Alien section. - Mouse on the Mind offers more WDW apartment listings I wish were real. - Rolling with the Magic visits The Ganachery at Disney Springs. Gotta go soon! That's crazy about the Electrical parade stream - anyone who was watching that would totally want to see the full parade! I know! I'm not against them interviewing people in the crowd, but c'mon - not DURING the parade. You are definitely not alone in your annoyance about the livestream! Like... I'm really happy for those people that they interviewed for being at Disney and all, but I'm over here trying to live vicariously and they're really not letting it happen. I know, right? Like, by all means, do the interviews, but broadcast them before or after, please.